In the credit card reward game, there are generally two camps. 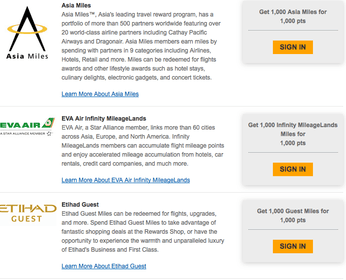 There are those who chase after cash back rewards, and there are those who are most interested in points and miles. The reason so many people tend to like points/miles over cash is the fact that they can often be transferred to leading frequent flyer programs at a 1:1 ratio, or even more than 1:1 in some cases. Don’t get it twisted. They aren’t looking for points so they can buy an overpriced blender from the American Express Membership Rewards catalog. That being said, let’s take a look at which credit cards allow you to transfer points to airlines, and also highlight those that do not so you don’t wind up buying that blender. The business version of these cards also allows for transfers to frequent flyer programs. *The Blue Cash cards from American Express DO NOT allow points transfers to airlines! Note that American Express charges a fee of $0.0006 per point transferred (maximum of $99) when you transfer your points to a U.S. Airline. That works out to $30 for 50,000 points, or $60 for 100,000 points transferred. They do not charge this fee if you transfer your points to foreign airlines. 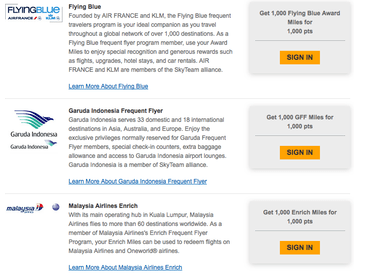 The transfer time for Membership Rewards to airline partners is generally fast, if not instant. Speaking of SPG, if you happen to have a Starwood credit card from Amex in your wallet, the associated points can be transferred to dozens of airlines. Really too many to list in fact. Assuming you have a Starwood credit card, simply log on to the Amex website then go to points transfers and check out all your options. 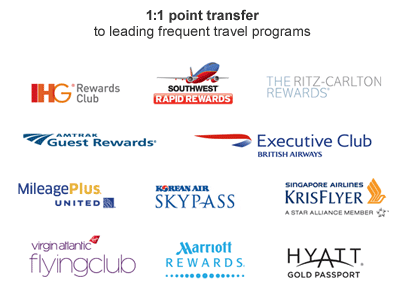 As you can see from the partial list above, the SPG cards allow 1:1 transfers to a ton of different airlines and offers a 25% bonus for every 20,000 points you transfer. For example, if you transfer 20,000 points to an airline, you’ll wind up with 25,000 points. So it’s really a ratio of 1:1.25. In other words, try to transfer in increments of 20k for the best value. 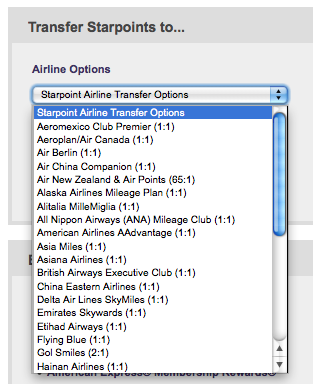 The downside is that transfers of Starpoints can take a minute…and by minute I mean up to 14 days. So you might miss out on that award flight. But they have more travel partners than any other program…that can’t be disputed. There is a newcomer in this bunch from credit card issuer Barclays (formerly Barclaycard) that allows miles transfers to frequent flyer programs. As of December 2018, Capital One allows points transfers to airlines, including the 13 listed above. The transfer ratio is at first glance a lousy 2:1.5, but cards such as Venture earn two miles per dollar spent, so it may actually be somewhat favorable depending on the card you use. *If you earn points via the Chase Freedom card and have any of the other Ink/Sapphire cards mentioned, it’s possible to move points to the rewards account associated with Ink/Sapphire, and then on to frequent flyer programs. It tends to be a pretty quick, usually instantaneous process to transfer Ultimate Rewards points to frequent flyer programs, which is a big plus. This can come in handy if you need just a few thousand more points to book a long stay somewhere, and your associated hotel rewards credit card fell short. 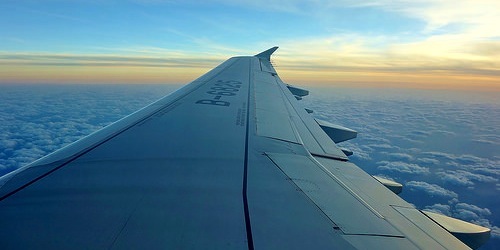 There is no fee to transfer points to airlines, though there is a waiting period of up to 14 days, meaning you might have difficulty holding a ticket and paying in points. You’ll probably have to transfer points first and then book a flight using points. The minimum amount to transfer is 1,000 points with no maximum. One tip to test the timing is to transfer the smallest number of points possible to see how long it takes to post. Once you find award availability, transfer 1,000 points and determine the timeline. Then transfer the rest of the points needed for the award ticket in a timely fashion to avoid losing out on your booking if availability quickly changes. In closing, when you do consider transferring points to airlines from any of these card issuers, make sure you check the applicable rewards chart to see the transfer rate and any potential fees. The list of airline partners can and will change, so it’s best to log-on to your credit card provider’s rewards site for the most current details. There’s a new credit card issuer in town when it comes to points transfers to frequent flyer programs.